Tony's mother in hospital after police assaulted her. suffering from physical collapse, authorities announced on Tuesday. prison Monday to proclaim their solidarity with fasting young man behind bars. a dustup with prison guards. from disrupting work inside the government prison. television networks that they were beaten up although their protest was orderly and peaceful. The police statement contended the protesters were "pushed away, not beaten." 1-The authorities should revoke all the sentences against all who were illegally arrested in the latest campaign. 3-The authorities should arrest and put to trial all those responsible for the latest crackdown campaign. 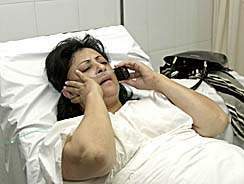 - urging the authorities to allow an independent medical team to supervise Toni's hunger strike. - stating that civilians should not be tried by the Military Court. -adopting the conditions put forth by Toni Orion. Little old but intresting "Lebanese fight Syria's grip"